Leading civil contractor Ertech has installed Konecranes overhead cranes in their new equipment maintenance facility that will service approximately 170 items of major plant, including scrapers, excavators, loaders and bulldozers. These new cranes have been designed to exceed benchmarks of safety and ergonomic operation. 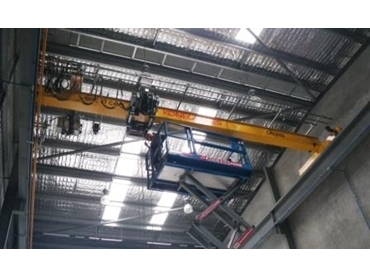 Ertech have installed both the 5 tonne and 10 tonne cranes in their headquarters, located in Wangara, Western Australia. “We chose Konecranes for our new maintenance workshop because we knew the product and liked what Konecranes had to offer us. We’re so far very happy with the cranes,” said Ertech plant manager Liam Keegan. Konecranes carried out the installation project and will continue to service the cranes and undertake ongoing statutory inspections for the company. “Ertech signed a maintenance agreement with Konecranes because, although we service our own construction plant, cranes are not our core business,” Keegan said. “We were delighted to be awarded the maintenance contract, which is by no means a foregone conclusion with the sale of cranes. It’s a tribute to the trust enjoyed by Konecranes among our customers, both new and established,” Trevor Ednie, Konecranes sales manager said. Ertech currently have operations in Western Australia, Victoria and South Australia and employs 800 people. The company runs a diverse set of projects, including earthworks, pipelines, roads, treatment plants, accommodation villages, jetties, airstrips, and dams, for private and public blue chip clients in the resources, infrastructure and land development sectors, including Chevron Australia, BHP Billiton and Landcorp. The 10 tonne overhead crane at Ertech has a 20 metre span, while the five-tonne crane, which straddles the automated welding bay, has a span of 9 metres. The cranes employ radio controls with the load display in the handset. “Radio remotes mean safety for the operators, who can stand well away from the loads being lifted and shifted. The remotes also give freedom of movement, ensuring the operators can choose a position where they have the best view of the cranes and loads,” Ednie said.